Up in the Alps at 3,000 feet, nestled in the small village of Törbel you will find the Swiss design company KARLEN. KARLEN has 10 highly skilled craftswomen who produce beautiful and useful bags in various forms and sizes. 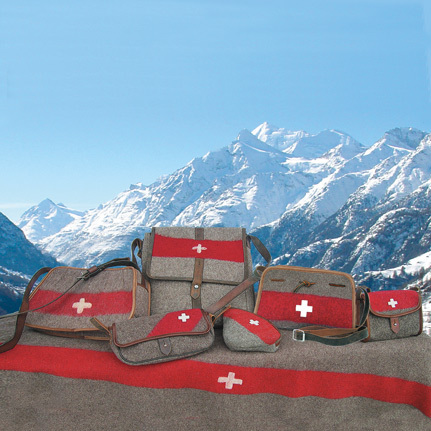 From makeup bags to weekenders, the KARLEN bags are made of unique one of a kind materials: Swiss Army blankets, heavy canvas from Swiss Postal bags, as well as cow hide from local tanneries. They also make the traditional Swiss collars for dogs which represent a family craft dating back over 250 years. Their craftwomanship has been passed on from generation to generation, and now it is available exclusively at «eurostyle your life».